PRESENCE OF HELICOBACTER PYLORI IN PATIENTS WITH ORAL MALODOR. Assya Krasteva 1 , Angelina Kisselova1, Vessela Dineva1, Vladimir E. Panov2, Aneta Ivanova3, Zahariy Krastev3. 3) Clinic of Gastroenterology, University Hospital "St.Ivan Rilski", Medical University Sofia, Bulgaria. Oral halitosis is an unpleasant multifactor oral pathology of health and social implications. Ninety per cent of the patients suffering from halitosis have oral abnormalities. The remaining 10 percent of halitosis sufferers have systemic disorders. The exact mechanism of halitosis occurrence is not clear, and in many patients the etiology is an enigma. In 40% in a group of 40 halitosis patients we found various microbes in the oral cavity, mostly candida, and in 35% we found IgG antibodies to Helicobacter pylori. In the - 56 control patients with gastric symptomes the rate of H. Pylori infection was 27%. We suggest oral microbiological examination to be performed simultaneously with a H. pylori test - if the dentist does not establish an oral cause for halitosis. Krasteva A, Kisselova A, Dineva V, Panov VE, Ivanova A, Krastev Z. Presence of helicobacter pylori in patients with oral malodor. J of IMAB. 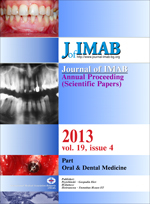 2013 Jul-Dec;19(4):419-421. doi: 10.5272/jimab.2013194.419. 3. Hein C. Helicobacter pylori and the oral cavity. Dimensions of Dental Hygiene. 2012; 6:16-21. 9. Van den Broek AM, Feenstra L, de Baat C. A review of the current literature on aetiology and measurement methods of halitosis. J Dent, 2007 Aug;35(8):627-635. [PubMed] [CrossRef].